Suitable for several Volkswagen vehicle, e.g. Citroen, Fiat, Opel, Peugeot, Renault etc. In the usage list you find all vehicles which have been delivered with nozzle holders KCA16S42. This nozzle guarantees Diesel-like starting of the engine and a perfect combustion of the veggie oil, respectively. For the assembly of the nozzle holder kombination we use new parts and professionally re-worked used original parts. The esd-17s42-komplett has been manufactured with an opening pressure of 155 bar - perfect for veggie oil use, but you can still drive on Diesel. 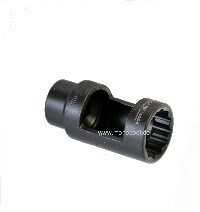 For the assembly the socket key for injection nozzles w-dn-27 is essentially required. With the cleaning fluid z-r-brems the working area can be cleaned in advance. Note: When replacing a nozzle assembly new flame arrester plates fss-ed are required. Please order 1 flame arrester plate per nozzle assembly. Please check the reference list (s. datasheet), whether this nozzle was originally built in your car. To ensure that we receive your used nozzle parts back, we charge a deposit of 35 Euro per nozzle holder. After receiving your used parts in acceptable unbroken undamaged condition, we return the deposit inbetween one day. Enter the model of the product you wish to add to your shopping cart. Copyright © 2001 Maischein Bitte beachten Sie: Über den Betrieb von Fahrzeugen mit Pflanzenöl liegen keine langfristigen Erfahrungen vor. Die Verwendung von Pflanzenöl als alternativer Kraftstoff kann zu Schäden am Motor und weiteren Fahrzeugteilen führen. Daher müssen wir jede Haftung für diesbezügliche Schäden ablehnen.